Welcome to the North American IPv6 Task Force website. The North American IPv6 Task Force (NAv6TF) is a sub-chapter of the IPv6 Forum dedicated to the advancement and propagation of IPv6 (Internet Protocol, version 6) in the North American continent. Comprised of individual members organized under Non-profit 501(c)(3) entities, rather than corporate sponsors, the NAv6TF mission is to provide technical leadership and innovative thought for the successful integration of IPv6 into all facets of networking and telecommunications infrastructure, present and future. Through its continued facilitation of publications, IPv6 certifications, IPv6-centric conferences, IPv6 test and interoperability events, IPv6 deployment readiness guides, and collaborative leaders from around the globe, the NAv6TF will strive to be the guiding force for IPv6 adoption and readiness in the U.S., Canada and Mexico. The North American IPv6 Task Force continues to thrive thanks to Jim Bound († 2009) and his initial vision of IPv6 adoption. Jim headed our movement and weaved the social fabric which brought us together. We continue to pursue Jim Bound’s visionary goal of IPv6 Deployment through our voluntary membership of scientists and engineers. The journey is the reward Jim and each of us thank you for inviting us on your flight. One of the messages that was clear at this year’s North American IPv6 Summit is that Dual-Stack is only halfway there. We don’t really want to maintain two networks (IPv4 and IPv6) forever. We want to get to IPv6-Only networks. The good news is that major corporations, such as Cisco, Microsoft, and Comcast, are moving in this direction. With them in the lead, we don’t have to reinvent the wheel when transitioning our own networks for IPv6-Only. However, another key message at the conference was that there will be a Long-Tail of IPv4 use. We don’t have the luxury of abandoning IPv4 just because it is simpler to manage a single protocol IPv6 network. Therefore we need to create transition mechanisms which allow older IPv4-only devices to gain access to the legacy IPv4 Internet. One of the transitions mechanisms which has potential is MAP-T (Mapping of Address and Port using Translation). Think of MAP-T as IPv6 quasi-tunneling in reverse. Rather than how we have been stitching the IPv6 network together with tunnels over IPv4, it is the reverse, carrying IPv4 over an IPv6-Only network. A MAP IPv6 address identifier MAP-T includes the IPv4 destination address and a 16 bit PSID (Port Set ID) in the last 64 bits (IID) of the IPv6 address. CE IPv4-IPv6 forwarding behavior where IPv6 packets arrive from the BR, and are subject to NAT44 and translated to the private address Dual-Stack network. MAP is bit more complex in that a CE and BR are required than standard stateful NAT64. However, it utilized stateless NAT64, which is expected to scale better. OpenWrt/LEDE both have MAP-T CE packages, and you can start exploring this transition mechanism now. In fact, Cisco has a very nice KVM Lab page, running everything (CE, DHCPv6 server, BR) in VMs, where no hardware is required. I still see stateful NAT64 being useful for smaller networks, but MAP-T takes great strides at solving the scale problems of NAT64. So start thinking about IPv6-Only network, it is closer than you think. 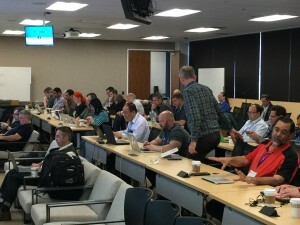 The North American IPv6 Summit was held in Sunnyvale last month. It is always a pleasure to be in a large room with people who get it. There is no convincing that we need to give up our comfortable Linus-blanket of IPv4 for something new and different. No, everyone in the room is a convert, and many are outspoken advocates. 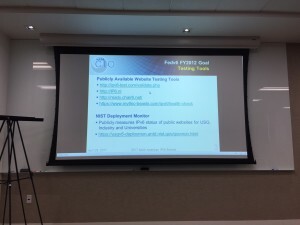 The conference was organized by the regional IPv6 Task Forces on the mainland: California IPv6 Task Force, Rocky Mountain IPv6 Task Force, Texas IPv6 Task Force, and Mexico IPv6 Task Force. Dual-stack is only half way. We need to start moving to IPv6-only networks. There were presentations on how Cisco, Microsoft, and Comcast are doing just that. IPv6 impacts on Cloud Computing, and IoT. A case study of BC Hydro operating 2 million smart meters (IoT) all on IPv6. Content is being delivered over IPv6, thanks to CDN (Content Delivery Networks), like Akamai and Cloudfare, fronting IPv4-only legacy sites. Microsoft adds SLAAC capability to Windows 10, Creator Update (11 April 2017). Now it is possible to have Windows and Android on the same SLAAC (Stateless Address Auto Config) IPv6-only network! Thanks to all the volunteers of the regional task forces, and Linked-in for hosting the conference. The presentations are posted online, in case you didn’t make it down to Sunnyvale last week. Hope to see you there next time. 13.25 years ago, in January 2004, the University Of Hawaii hosted the Techs In Paradise conference in Honolulu. 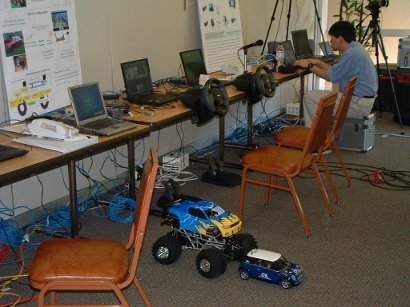 During that conference we provided IPv6 connectivity to Japan, via our STM-1 to APAN Tokyo, and NICT operated a demonstration involving radio controlled model cars with tiny cameras aboard, where drivers at JGN Tokyo could operate cars in Honolulu, and vice versa. It was the beginning of operational IPv6 networking in Hawaii. Sure, for several years after, an IPv6 outage didn’t cause any users to call the help desk, but the operational core was there. CRL (now NICT) researcher operates the system from the Honolulu end. In mid 2009, we turned on IPv6 peerings with TW Telecom, giving us IPv6 connectivity on all sides, no longer exclusively with Internet2. In the 8 years since, we have operated an operational dual-stack IPv6/IPv4 network, and the team mantra became “IPv6 is not an experiment – there is no IPv6 guy, we are all IPv6 guys.” IPv6 operations have gone smoothly. New staff receive no IPv6 training beyond OJT. And like staff at other organizations who have deployed IPv6, the common impression is that it’s pretty much like operating an IPv4 network, with longer addresses. There are a couple of new concepts to assimilate, with addressing plans, address assignment and tracking, but the operation of a dual-stack network does not require your staff to learn anything that they’re not already required to learn about advancing technology on a weekly basis. As of right now, Google, YouTube, Netflix, FaceBook, Akamai, and other big content providers all provide our users with content over IPv6. Within our State-wide network, IPv6 deployment is still elective for departments and institutes that operate their own LANs, but ITS administered networks include IPv6. 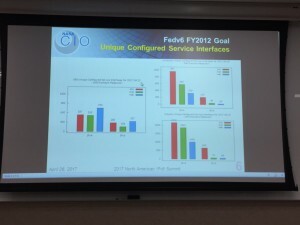 Most of our institutional content is not yet offered over IPv6, part of a national condition, where IPv6 connectivity is deployed in 111 different Internet2 Member university’s networks, but not in most of their data centers. In the process of meeting various people at gatherings around the country, and reading various articles and posts on the Internet, I’ve come to appreciate that there is a lot of loose, non-sequitur rationalization afoot, and little is being done to counter it, or address it. To fill that void, I want to address a series of prevalent rationalizations people offer as to why they’re not doing IPv6. I’ve been doing it for 13 years, and I have to say that this excuse doesn’t stand up to scrutiny. IPv6 works as well as IPv4, and it’s no more or less secure or private. Plus, it’s out there, on your network, whether you like it or not, since all modern operating systems include it, and it’s turned on. If you’re pouring energy into turning off and suppressing IPv6 on your network, you’re wasting more time and energy than you would just including it in your plans. It’s a mystery to me how anyone could offer this as a reason, and not immediately realize how silly it sounds, but somehow people manage to. Of course your users aren’t requesting it, why would they? Furthermore, you could use it as a selling point, in the tradition of printing the words “Field Effect Transistor Technology” on a stereo receiver, or offering Internet connections with “Fiber”. Users don’t care what layer 3 protocol they’re getting, they don’t care if their fast connection arrives over fiber or coax or WiMax, until you tell them it’s a premium feature. Bottom line is: deploying IPv6 is positioning your network to provide better experience to your users, a better experience for which your users will call you to account when you don’t provide it, or more likely, they’ll vote with their feet. Early, pervasive IPv6 deployment is competitive. Compete or perish. It’s really not unfamiliar in practice, those who have deployed it usually say that it’s like managing IPv4, with longer addresses. The difference between organizations that deploy IPv6 and those who don’t is simply rationale. The IETF is not a software vendor. You are part of the process by which IPv6 will fill your future needs. If there are things about IPv6 operations that you want to effect change in, become part of the process. Furthermore, the IETF got a great deal right, after MUCH rumination and discussion. They envisioned a future for the Internet, they considered whether it was better to make IPv6 backward compatible or not, they came up with what we have now. The next step is to deploy it, and discover the details in practice. In most layer-3-protocol-change-denial rationalizations, there is a tacit insinuation that someone, somewhere is negligent, and that deployment can only reasonably occur when that someone-who-is-ultimately-responsible for IPv6 gets their act together. What the world needs now is for enough networks to deploy so that the global Internet reaches the tipping point, where those who face problems from IPv4 address exhaustion can begin to use IPv6 as a solution. In order for that tipping point to be realized, a majority of networks must deploy IPv6, both by providing user connectivity and by providing services and content over IPv6. If “critical mass” is the needed milestone, then anybody who’s in a position to deploy IPv6, but doesn’t is the obstacle to it becoming useful. Who’s accountable? You are. If you’re tempted to pick nits and offer anti-deployment counterpoints, consider that it’s up to you. You’d be arguing with yourself. 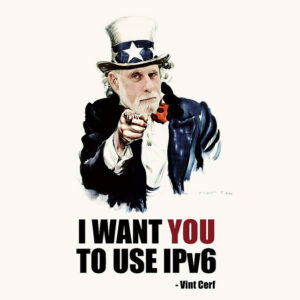 I don’t offer to account for your talking points, but I do offer to engender a discussion about v4/v6 parity, about developing best practices, and about documenting solutions that will enable you to use IPv6 today to deploy systems that will be ready to engage the future-ready Internet. Minimal Internet citizenship involves taking the steps to deploy a dual-stack network, with NATed v4 and native v6 if necessary. Call your ISP and complain, pound on the table when your vendors say “probably first quarter next year”. The global community of Internet operators will ultimately determine the Internet’s form, and the best form available is an IPv6 Internet. Microsoft released the Creator Update last month (11 April 2017) with lots of interesting stuff. But the most interesting for IPv6 is support for the RDNSS field in the RA (Router Advertisement). The RDNSS field is the one that carries DNS server information in the RA. In order to run an IPv6-only SLAAC-based network the host must need 2 things: an address, and the address of a DNS server. Without DNS, IPv4 or IPv6 is pretty useless. The fact that MS is now supporting SLAAC-only networks is a huge shift from their previous DHCPv6 only stance. Why is this important? Because there are use-cases for SLAAC-only networks, and now not only can you use your Android devices (which don’t do DHCPv6) but also your Windows 10 machines as well. Windows continues to dominate the PC market with about 85%. Now with Windows 10 Creator Update, there is no excuse to not deploy IPv6 in your network now. These have been posted to the RMv6TF web site. 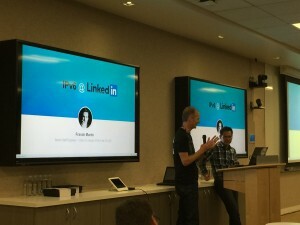 Stan Barber was recognized for his contribution to the recent meeting at LinkedIn in Sunnyvale. He was among many folks led by Scott Hogg of RMv6TF that organized the meeting under the North American IPv6 Task Force. He was recognized for his work organizing the awards ceremony where several North American ISP were recognized for achieving 20% or more IPv6 Utilization on their networks. Stan is pictured with Scott Hogg below. Kevin Jones brought us up to speed today on Federal v6 Goals from the FY 2012 bill. 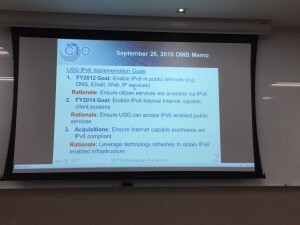 Here are a few of his slides to help us understand OMB initiatives when compared to implementation progress. Why Is Microsoft Internal IT Moving to IPv6-Only? 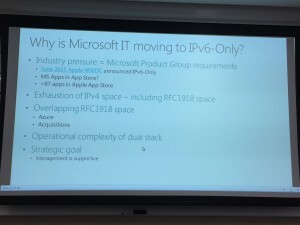 Take a look at Veronika McKillop’s slide to help us understand why her teams at Microsoft are moving to IPv6 Only networks for Internal IT use. Microsoft currently has two test IPv6-Only networks in Redmond, WA and also recognized that IPv6 adoption will be supported because of the well known “Microsoft effect” which posits that 85% of global laptop/desktops are windows based IPv6 capable coupled with the fact that millions of devices (ie: servers, Xbox, tables, HoloLens) are designed for IPv6 networks. Posted in CAv6TF	| Comments Off on Why Is Microsoft Internal IT Moving to IPv6-Only? We are getting ready to start Day 2 of the North American IPv6 Task Force Summit. The Yosemite event room at LinkedIn Headquarters is filling up and we are getting started! Thank you again to LinkedIn for hosting our event! Today and tomorrow, people from around the continent are gathering in Sunnyvale, CA to hear more about the status of the migration of the Internet to IPv6. Over 100 people are registered for the event. After the event, there will be recordings of the talks available for anyone to listen to posted. More details on that will be made available at a later day. There are several folks attending here from Texas and I am glad to see them. John Curran’s presentations are always lively, educational and wholly interactive (especially during Q&A). Today’s presentation at LinkedIn’s Sunnyvale Headquarters was no exception to the rule as John focused on how to build a better IPv6 internet that users will actually be interested in using. He also reviewed challenges associated with enterprise IPv6 adoption delays. His first point discussed ideas on changing the fundamentals of network governance in IPv6 and how it could virtually eliminate botnets, spam, and general NAT headaches. Notably, those changes and choices would also eliminate a lion-share of demand and spending for boundary security solutions used by many enterprises today. He continued by pointing to the attendees in the room reminding us of our accountability and that we, “…are the ones building a new internet on IPv6 yet running it the same way that we ran the IPv4 Internet.” True, many network engineers, especially in enterprises, are seasoned with v4 habits such as straining to conserve IP addresses. As such, we run the risk of doing too much subnet-ing with IPv6 resulting in a loss of operational visibility by breaking the rules of nibble boundaries. Considering most assignment blocks will be assigned as a /32 or /44 with plenty of address space to spare, we really have no excuse to do things incorrectly. From our perspective, this just proves that we still have a heck a lot of work to do educating network engineers if IPv6 adoption is going to happen at the enterprise level. Speaker’s List of NAv6TF meeting has been posted. 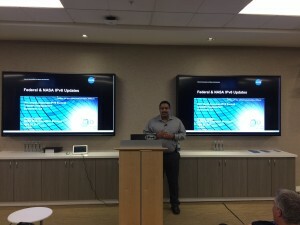 Posted in General, News, TXv6TF	| Comments Off on Speaker’s List of NAv6TF meeting has been posted. Registration Open for the 2017 NA IPv6 Summit! Registration & coffee daily from 8:00 am – 9:00 am. Posted in News & Updates	| Comments Off on Registration Open for the 2017 NA IPv6 Summit! Registration is now open for the ARIN 39 Public Policy and Members Meeting, which will take place 2-5 April 2017 at the Hotel Monteleone in New Orleans, Louisiana. 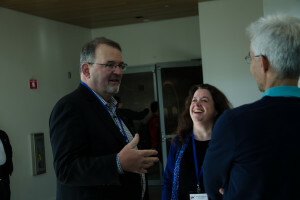 ARIN holds open, biannual Public Policy and Members Meetings where attendees gather to discuss draft Internet number resource policies, network with colleagues, and attend workshops and tutorials. For hotel details, travel information, and more, visit: https://www.arin.net/ARIN39 . Meeting registration is free when completed in advance of the meeting date. Attend ARIN on the Road in Little Rock, AR. 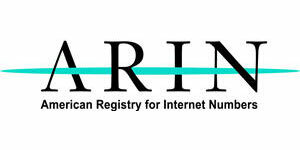 You are invited to attend a free one-day ARIN on the Road Event on 7 March in Little Rock. The meeting takes place in the Capital Hilton, starting at 10:00 AM – 3:30 PM CST; Registration and Continental Breakfast at 9:00 AM CST.Topics include Life After IPv4, DNSSEC, Resource Certification, and IPv6. Registration is required and details are available at: https://www.arin.net/littlerock. Please select this link to register. Some more on the upcoming event. At this year’s IPv6 Summit event we will celebrate all that has been accomplished regarding IPv6 deployment. We will also discuss the remaining challenges for IPv6 adoption. 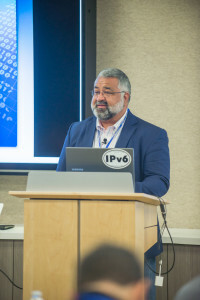 The IPv6 Summit event this year will focus on the accomplishments that have been made in recent years that have driven the accelerating growth in IPv6 Internet traffic. The event would like to celebrate the hard work performed by broadband service providers, mobile carriers, online content providers, content distribution networks, equipment manufacturers, operating system manufacturers, and numerous others. There will be a single-track of presentations through the 2-days.